Written by Eat Mexico founder Lesley Téllez, Eat Mexico the cookbook encapsulates everything we love about Mexico City street food. Lesley, a journalist and former Mexican food blogger, shares some classic recipes from local street stands, city markets, and small homestyle fondas. The book takes readers on a personal odyssey, too, sharing Lesley’s passion and excitement as she moves to Mexico and watches the food alter the course of her life. 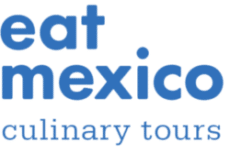 In this book you’ll find recipes for tacos al pastor, homemade corn tortillas, tlacoyos, squash flower burritos, tacos de canasta, aguas frescas, barbacoa, salsas, and dozens of other delicacies tried directly on our tours! Published in June 2015 by Kyle Books, Eat Mexico: Recipes from Mexico City’s Streets, Markets and Fondas has been praised by Food52, Leite’s Culinaria, Edible Feast, The New York Times, Serious Eats, The Chicago Tribune, The Dallas Morning News and more. The cookbook was an Amazon bestseller and is currently in its third printing. Eat Mexico features than 100 recipes, gorgeous on-location photography of Mexico City’s streets and markets, and practical Mexican cooking tips. The book is a must for anyone who loves Mexico and its unique food culture. If you loved our tours, it’s the perfect way to recreate part of what you experienced once you’re home. Order the book now on Amazon, or add one on to your tour at checkout and we’ll deliver it directly to your hotel. The cookbook makes for great—and mouth-watering—airplane reading!